I don't really want to use my Leo-Bodnar permanently for EsHail as it is so useful for other things. I have researched other solutions to the 25 MHz reference. Firstly, you don't really need to lock to GPS. A very good solution would be to take a good 100MHz ovanised reference oscillator and divide it by 4 to get to 25MHz (or 5 MHz x 5 or whatever) and then low pass filter it. References are typically stable to a few parts per billion, especially if kept indoors and left switched on. As crystal oscillators the phase noise should be excellent. Old professional test equipment is often a good source of these references, often 5 MHz, 10 MHz or 100MHz. They used to be very common at rallies, but not so much now. Old oscillators are often the most stable due to the ageing characteristics of the crystal. If you find a 25 MHz reference, Robert's one of your parents siblings. Surplus ovanised 25 MHz references are rare, but for about £20 you can buy a commercial 25 MHz temperature compensated crystal oscillator. For example the D75F-025.0M which is stocked by Digikey, datasheet here: http://www.conwin.com/datasheets/tx/tx237.pdf At 5x7mm it is small enough to fit inside the LNB and has just about acceptable phase noise. It is stable to 0.5 ppm over 0-70C and should be much more stable if kept indoors. I don't know if anyone has tried the 25MHz reference in those Chinese boards we use in the Portsdown LO. The QRP labs board mentioned above can also be locked to GPS via the push and pull method using the 1 PPS. This is used in the WSPR beacon for example. I am sure it could be made to output 25 MHz or whatever frequency you need relatively easily but I am not sure about the phase noise. Square waves are rich in harmonics and most references including the the Leo-Bodnar have harmonics right into the IF region. If you are using two cables then the cross coupling is probably not too bad unless you are using those twin coax satellite TV cables, but when using only one cable like I am, you end up with a marker every 25 MHz. Not usually a problem but it can be if it coincides with the signal you are trying to receive. A low pass filter completely eliminates this. I have 8 of the Bias-T / Reference boards left, they work fine as long as you order the right parts. My reason for bodges was the boards arrived much sooner than I expected and I hadn't got around to ordering the correct size BNC and I am impatient, so I made another fit. I will ask BATC if they want to do anything with these in the longer term - it is a niche market as I suspect few besides those of us here, are capable of dealing with small SMD parts and doing the necessary surgery to LNBs. Thanks Mike for the comprehensive reply, useful to us all. Will look at the GPS locked Si5351A Synthesizer, ovens etc. Maybe something else out there. Please Pm if board available, costs etc, also see if Eshail-2 becomes a popular project. I will need addresses via PM if people want one. If there is a lot of demand I will need to limit it to one each until I can get some more ordered. 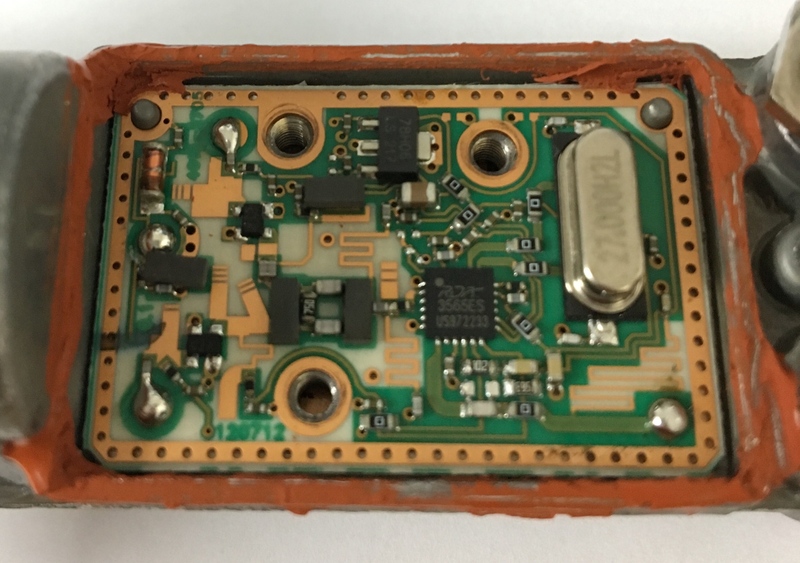 Got a second 27MHz dual Octogon LNB to mess with and based on a post M0EYT made to the ukmicrowave list I made the small modification to fix the output from the lower board to horizontal polarization on any input voltage. It should be handy for using both transponders without having to use 18v or twist the LNB to get horizontal. The board/chip was a bit different to the 25MHz one pictured in the post but it has the same voltage divider arrangement on both sides and removing the 8.25k resistor works to set the voltage to the sense pin high to use horizontal. It seems to work fine and receiving BADR-4 using 12v from the Minitiouner on that output without twisting the LNB 90 degrees as I was having to do before. It does mean I'm going to have to get 27MHz in via another cable rather than abusing the lower boards input as did with the other LNB. I might leave the wide band horizontal fixed board as is and just feed 27MHz to the top one for narrow band use if I can't figure out a non messy way to feed both. As mentioned in earlier post, with Twin LNB. I did the 26mhz and 27.5 mods on one a while back giving me approx. 980mhz from one IF out and 438mhz from the other for 10.4ghz in. Reading up on the Forum and other sources, decided to get stability from inside the shack and fully tuneable as far as possible. Basically the same as Andy's, but isolating the "F" socket in the top RH corner to feed L.O. from the shack, making one of the twin redundant. I have another LNB to try, L.O up and I.F down with one cable as per Mike G0MJW Mods. I know what you mean about removing the crystal. It needs two soldering irons, skill and patience to do it without damaging the pads. Even then it's likely to bring the pads with it. Looking at that LNB I can see what looks like two 0R resistors coupling the crystal to the chip. It might be easier to remove one of those rather than the crystal. There are quite a few 0 resistors. Perhaps remove both and replace one with the DC blocking cap. They look like 0402 size. Quick update on last post, fed 27Mhz up cable to LNB this P.M. at 0dBm in place of 27Mhz Xtal. Signals from BADR almost locking. Will fit amp and we are good to go. Has anyone already done the 12v horizontal only resistor mod on an Octagon OSLO single LNB? I think I've identified the resistor to remove but I'd like other eyes or experience please. Reading about and planning a receive capability for es'hail 2 I have given some thought to a simple and accurate frequency source in place of the 25/27MHz crystal in the PLL LNBs. Trying to find a RELIABLE/trustworthy supplier of an Octagon dual PLL suitable for conversion. The eBay supplier I found (https://www.ebay.co.uk/itm/Octagon-OTLS ... 2108842161 ) assured me that it was a PLL unit but couldn't/wouldn't give the the number off the LNB case.